Bio: Hi, I’m Sarah. I’m a mum of two, when I’m not looking after the little ones I help run The Sleep Advisor blog. We believe with all our hearts in the immense power of a good night’s sleep and our aim is to help everyone get more of them. For most of us mums, sleep is something that happened to us when we were younger – and childless. Across the world mums are exhausted and this sleep-deprivation has a real impact on every single facet of our lives. Fortunately technology, specifically our smartphones can here to help. At least it can when you tame the amount of blue light they emit. And while the boffins in Silicon Valley have yet to install a button on our smartphones that sends us instantly to sleep, they have been working on a few other useful apps. 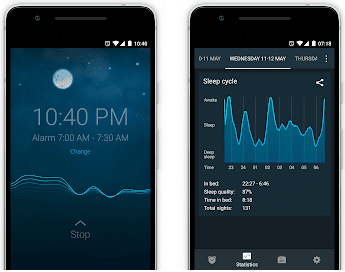 While you sleep, Sleep Cycle sits under your pillow gathering data. Using the information it collects, it then wakes you at the perfect time in your sleep cycle to stop you feeling groggy. Sleep Cycle has a great user interface and provides a plethora of easy-to-read graphs to help you make sense of your sleep patterns. So, on those rare mornings you’re not rudely awoken by kids jumping on the end of your bed demanding breakfast, Sleep Cycle could be your perfect alarm clock. If years of sleeping with one ear open to check on the little ones has left you the lightest of light sleepers – waking to the slightest creak or most distant siren – then White Noise could be the app for you. White Noise does exactly what it says on the tin and provides white noise. The fuzzy static sound has been proven to help light sleepers drown out unwanted sounds, relax and focus on the task at hand – getting some sleep. The White Noise not only has white noise, it also has pink noise, brown noise (like white noise but lower in frequency), and many more soothing sounds – from an oscillating fan to a cat purring. And if these sounds aren’t enough the app also allows you to record your own relaxing sounds. Maybe the sound of a nearby waterfall could work for you, or even the sound of your partner droning on about cricket. That last one would certainly work for me! Like White Noise, unsurprisingly Baby Shusher also does exactly what you the names suggest it does – it shushes your baby for you. We’ve all been there, swaying and shushing for literally hours, shushing until our lips frankly can’t generate a single sound more. Well, this is exactly where the Baby Shusher app comes to your rescue. This handy app replicates a rhythmic shushing noise. It has a useful timing feature that allows you to keep the noise going for as long as you like and it has a smart equalizer function that adjusts the volume of the shush should your baby begin to stir and cry again. Baby Connect is one of the most popular and most comprehensive baby-tracking apps out there. Now just to be clear baby-tracking doesn’t involve planting a tracking device on your child and then releasing them into the wild. Baby-tracking is the process of using data to improve your child’s life. By inputting information regarding feedings, diaper changes, medicines and a whole variety of activities you’re able to keep tabs on every aspect of your child’s life. Particularly sleep. Baby Connect allows you to track your child’s sleep cycles, when they go down, when they wake, how long they napped, etc., etc. The app then allows you to use this data to plot graphs and spot problems, trends and patterns. Headspace ranks as the highest quality mindfulness meditation app out there on the market. If you haven’t heard the news, meditation is no longer just the domain of unwashed hippie types, it’s for everyone and it can be especially useful for mum’s looking to get a little relaxation. Countless mum’s I know sweat by it. And if you’re a newbie to meditation, like I was, Headspace is the perfect way to get started. It provides a series of guided meditations, slowly introducing you to the concepts behind mindfulness and building up your capacity to meditate. This one isn’t just for mum’s it’s for anyone trying to find a little oasis of clam in this hectic modern world. 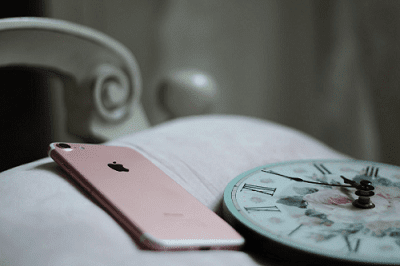 There you have it – five of the most popular apps out there for busy mums. Give them a go. Let technology providing a helping hand because let’s face it, when you’re a busy mum sometimes we need all the help we can get! If these five don’t work for you, don’t give up, they are just a fraction of the almost endless number of apps out there for mums. Keep trying until you find the one that works best for you. And if all the apps in the world aren’t helping you get the rest you deserve, then there are a few places to go for tips and advice. Try the Sleep Advisor, for some more helpful hints.